The L-Series switched to a handed modular three-wire request to exit (RX) switch. This change was originally completed on electrified locks in October 2014. 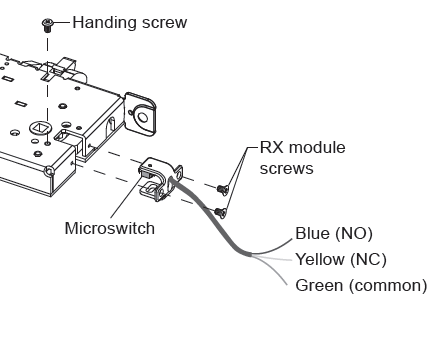 The RX switch will have a molex connector attached requiring use of Allegion Connect Harnesses and IVES hinges, or connector can be snipped off and traditional splicing methods employed to wire lock. The switch is to be wired for normally open or normally closed in the field and consists of three wires. BLUE wire is for use in normally open applications. The switch rating is 10,000,000 cycles. The L-Series switched to a three-wire request to exit (RX) switch in May 2010, and normally open or normally closed had to be specified when ordered. The RX switch was not sold separately and had to be ordered with the lock. Part number L283-263 was used for ordering with L9000 locks and part number L283-239 was used when ordering with LV9000 locks. BLUE wire is for use in normally closed applications. are mag locks usually normally open or Normally closed? On Rx applications can SPDT switch be adjusted?